T2:3D is hitting theaters! No, not the show at Universal theme parks (with the same name), the actual movie Terminator 2: Judgement Day which is expected to get a full 3D conversion. The whole project will be overseen by James Cameron himself. This re-release was announced this morning with the reveal of the movie poster, expected to start showing up at theaters any time now. The film will be released sometimes in 2017. Currently 2 of the 3, T2:3D attractions remain at Universal Orlando Resort, and Universal Studios Japan. Hollywood’s version was removed in 2013 to make way for Despicable Me: Minion Mayhem. 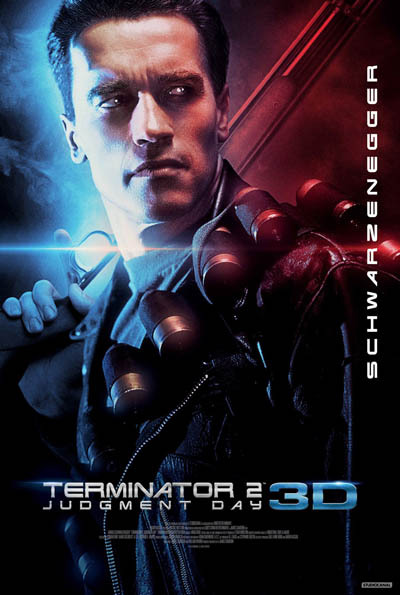 What’s a more perfect way to spend an afternoon at Universal Orlando seeing Terminator 2 in 3D at CityWalk, then heading into the theme park to see the literal sequel to the movie at the Termniator 2:3D Battle Across Time attraction. For more information about Universal Studios, visit the official website by clicking here!